To select the desired resolution, enter the internal menu, and choose the "LCD size" sub-menu. - To enter the internal config menu you can now press both up and down buttons. (without usb stick inserted). - The internal config menu can now be browsed without the selection button, just wait 4 seconds to select an item. now saved into the Flash memory and restored/used at power up. - Some more internal optimizations. Just got this information : it seems that some 128x64 screens are directly compatible the current firmware version without any change. This is not the case with the 128x64 i got here. the screen matrix is probably connected differently. I've put together a design for a 3D printable replacement casing for the Gotek drive. There's now a 'preset' for what should be a box that's compatible with the existing Gotek box's lid. I have not had access to the 3D printer for the past week so I haven't yet been able to print it and check how well it actually fits. The update also includes a configurable 'shroud' behind the faceplate - so that the seam between the box and the lid isn't right at the front, but set back a bit, or if you're using just the frame, there is some cover all around the faceplate shape to slide into the bay. There's also a configurable bezel that can go around the faceplate. Finally, I've added some extra material around the mounting holes to give a better grip. And I've pre-ordered the just-announced Original Prusa i3 Mk3 3D printer - they have an excellent reputation and are frequently listed as the best desktop 3D printer. Very nice, but much effort because of two characters more width of the display, the OLED display is usually in two minutes built in the original housing ..
Not 2 more, but 5. You have the option to display up to 21 characters with the hxc firmware. Um, so? It's easier still to just use the 3-digit 7-segment LED display. You put effort into emulating the 16x2 character LCD display so that you could use the 128x32 pixel OLED instead, even though it was easier to just use an LCD module. A 3D printed case can be better than modifying the Gotek case; for example, the OLED display itself ends up much closer to the front of the faceplate. In my case, I'll be putting two of these into Ensoniq keyboards where the floppy drive bay aperture is actually taller than 25.4mm, about 32mm; using the original Gotek case I'd have to add some extra material so as to not leave any empty space - but I can instead 3D print a case that fills the entire space, and places the OLED display better, and doesn't require destructive modifications. A 3D printed case could also allow for a display that was wider, by moving the PCB within the case; or for a case that was smaller (half height, to allow sharing a single 3.5-inch bay with a slimline floppy drive perhaps) or larger (fit into a 5.25-inch bay without needing a separate mounting kit). You put effort into emulating the 16x2 character LCD display so that you could use the 128x32 pixel OLED instead, even though it was easier to just use an LCD module. Last edited by Kingstener on Mon Sep 25, 2017 6:03 pm, edited 1 time in total. Remove the usb stick, press both buttons. You have then access to tons of options. there is an lcd section. yes, that was the decisive step ... ) cool..
[ADMIN EDIT] : Confusing video - bad firmware. What is the exact OLED display size, which can replace/fit the current original 3 digit LED display hole without being forced to buy a new cover or modify the current cover? Probably doesn't exist. Just take the one above and set the 16x2 display mode (this is the default one). No need to modify the box with this setting. 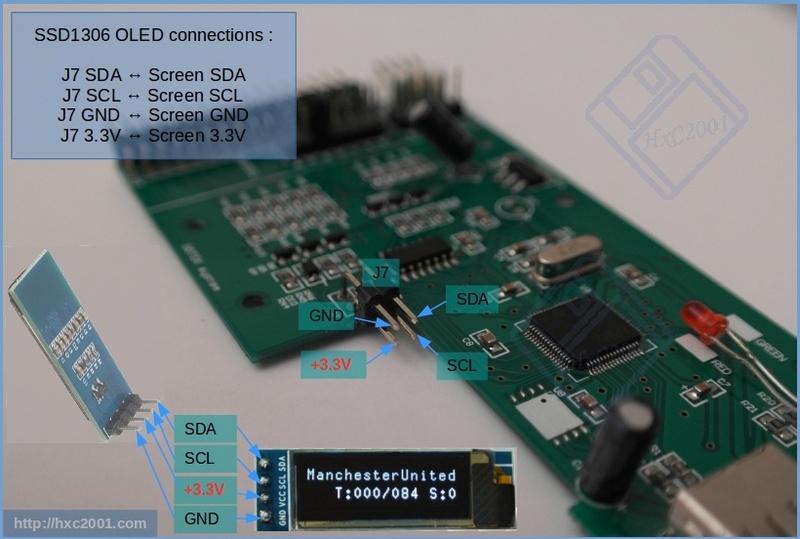 The blogger is linking to something called "0.91" IIC I2C Serial SPI OLED LCD Display 128x32 3.3V/5V AVR PIC STM32 Arduino"